NOTE: • If DTC P1217 is displayed with DTC UXXXX, first perform the trouble diagnosis for DTC UXXXX. • If DTC P1217 is displayed with DTC P0607, first perform the trouble diagnosis for DTC P0607. Refer to EC-361, "DTC Logic". CAUTION: When a malfunction is indicated, be sure to replace the coolant. Refer to CO-12, "Changing Engine Coolant". Also, replace the engine oil. Refer to LU-10, "Changing Engine Oil". 1. Fill radiator with coolant up to specified level with a filling speed of 2 liters per minute. Be sure to use coolant with the proper mixture ratio. Refer to MA-12, "Engine Oil Recommendation". 2. After refilling coolant, run engine to ensure that no water-flow noise is emitted. NOTE: Use component function check to check the overall function of the cooling fan. During this check, a DTC might not be confirmed. NO >> Go to EC-370, "Diagnosis Procedure". WARNING: Never remove the radiator cap when the engine is hot. Serious burns could be caused by high pressure fluid escaping from the radiator. Is the coolant level in the reservoir tank and/or radiator below the proper range? YES >> Go to EC-370, "Diagnosis Procedure". Did customer fill the coolant? YES >> Go to EC-370, "Diagnosis Procedure". 2. Perform “COOLING FAN” in “ACTIVE TEST” mode with CONSULT-III. 3. Make sure that cooling fan motors-1 and -2 operate at each speed (LOW/HI). Perform IPDM E/R auto active test and check cooling fan motors operation, refer to PCS-14, "Diagnosis Description". 1. Perform IPDM E/R auto active test and check cooling fan motors operation, refer to PCS-14, "Diagnosis Description". 2. Make sure that cooling fan motors-1 and -2 operate at each speed (Low/High). NO >> Go to EC-456, "Diagnosis Procedure". Check the following for leak. 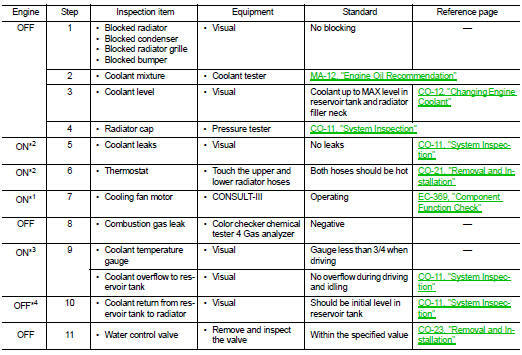 Refer to CO-11, "System Inspection". NO >> Replace radiator cap. Check thermostat. Refer to CO-21, "Removal and Installation". Check water control valve. Refer to CO-23, "Removal and Installation". Refer to EC-182, "Component Inspection". NO >> Replace engine coolant temperature sensor. If the cause cannot be isolated, check the following. *1: Turn the ignition switch ON. *2: Engine running at 3,000 rpm for 10 minutes. *3: Drive at 90 km/h (56 MPH) for 30 minutes and then let idle for 10 minutes. *4: After 60 minutes of cool down time. For more information, refer to CO-9, "Troubleshooting Chart".